It means a lot to me to be nominated as a Salute to Service Award recipient because of what these servicemen and women do for our country. Also, my Father served in the Army for over 20 years. The military community did a lot for me growing up, and it means a lot to be able to give back to this community. I really feel like the Army did a great thing for our family. It took us out of poverty and gave us a stable life. It was a solid, safe upbringing. It gave my Dad a chance to have a respectable career and learn discipline, which he’s passed down to me. He went to work everyday at 4a.m. and came home at 5p.m. He made all kinds of different sacrifices and risked his life at war for our country. It shows you the character of this man and gave me a lot of respect for him. I’m proud that my Father served in the military, and I’m proud of all of the things that he’s done and all of the sacrifices that he made for our family and our country. I embrace it. I could look back and pinpoint everything, but I just think he did a great job overall of showing and teaching me things. And I really think so much of it carried over to the NFL. It’s important to me that my Dad knows how much respect I have for the servicemen and women that he’s been to war with – and did or did not come home with – and so I try to give back to the servicemembers and their dependents as much as possible. I know how stressful their lives can be and how taxing it can be on the whole family. He sees the newspaper clippings and reads online about the work that I’m doing, and it definitely brings a smile to his face to see me giving back to these communities. Like I said, the Army has given so much to me, and I feel like it is my duty to give back. I’m proud that our Foundation is providing kids at Ft. Hood military base in Texas, where I grew up, with opportunities to hear from people who spent time there and went on to be successful. I’m especially proud of our annual football and cheerleading camp, where we host hundreds of kids for free. And the most important part is that we have current and former NFL players and cheerleaders who grew up around Ft. Hood come back just for the camp. Not only do we have a great showing of kids, but they also recognize the faces of the people who come back for the camp every year. And the kids listen to them because they respect the type of people they are and understand that this person is from my community and I can be like them. It really doesn’t work unless the kids get to know who these people are, spend time with them and trust them. Putting on this free camp for the two days that we do is so vital. Growing up on a military base, you don’t really get to see consistent faces. People are coming and going, moving and getting transplanted into different communities. There’s not really a face of the base, so to speak. So it’s hard to aspire to be something if you don’t have mentors or an understanding of the history of where you are. That’s one of the biggest issues in military communities, and I think the camp has been able to help with this, as well as provide a platform for people from the area who have gone on to be successful to come back and share their stories. 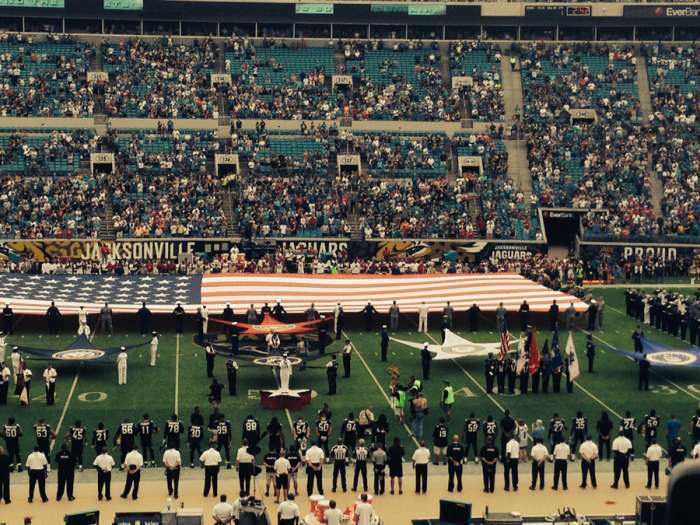 I can’t say it enough, but I think it’s really important that the NFL recognizes the vets and servicemen and women. To me, all I knew was the military. It brought so much peace to me because it was who my Dad was and what he fought for. The military fights for us so that we could be whoever we want to be. It really means a lot to me, especially when I go back home, to see these soldiers in wheelchairs, and all of the amputees, who – thanks to them – have really allowed us to do what we love to do. I can’t thank them enough and I’m really happy that the NFL can thank these guys, like my father, like my uncles, like my brothers-in-law and sisters-in-law, who all serve in the military and continue to fight for our freedom.